The Death of Edgar Evans on Scott's Return from the South Pole. On February 17th 1912, Edgar Evans died near the foot of the Beardmore Glacier, as he returned from the South Pole with Scott, Oates, Wilson and Bowers. The Welshman who Scott had described as “…a giant worker”, was 35 years old, and tragically, left behind a widow, Lois, and three young children. The five men had arrived at the Pole a month earlier on January 17th, only to discover that Roald Amundsen had beaten them there, having arrived at 90º South, on the 15th of December. The arduous return journey, soon became a desperate struggle for the Polar Party, and as they descended the Beardmore Glacier, both the physical and mental condition of Edgar “Taff” Evans were in steady decline. As Scott’s party made their weary return from the pole, Evans was suffering badly from frostbite to his fingers, nose and cheeks. He had also fallen into crevasses on two occasions. The second of these falls on February 4th, when both he and Scott fell, prompted a rapid decline in Evans’ condition. He suffered a serious concussion from which he would never recover, and Scott described him afterwards as being “broken down in the brain”. Evans did struggle onwards though, but dropped out of the harness, and no doubt his condition delayed the progress of the team. Considering the fine margins of the return plan, and the harshness of the theatre it was being played out in, it can be suggested that the decline of Edgar Evans between the 4th and 17th of February, would subsequently contribute to the deaths of the rest of the team. Surplus rations were used up as depots were not reached on schedule, and the consequent shortfall of distance covered, could perhaps be equated to the 11 mile expanse, between One Ton Depot, and the bodies of Scott, Bowers and Wilson. Edgar Evans and Tom Crean. On the other hand the severity of the weather encountered, the inadequate diet, and Oates‘ protracted demise also played a telling part in the outcome. Even if the three men had reached One Ton Depot, it is unlikely they would have survived. They would have missed Apsley Cherry-Garrard, Dimitri and the dog team, sent to replenish the depot, as they had left and returned to base on March 10th. The polar party were flailing forward, some 60 miles south of the cache, on that day. Arrival at One Ton would have meant a brief respite in hunger, and a faint revival of hope, but without any help, the exposure suffered and still to endure, was simply insurmountable. On February 16th, nearing the foot of the Glacier, Evans collapsed and the following morning he fell behind the team, who retraced their steps to fetch him. He was in an almost delirious state when they located him – Scott noted in his journal, “He was on his knees, clothing disarranged, hands uncovered and frostbitten and with a “wild look in his eyes”. They set up camp and placed the near comatose Evans into a tent, where he died later that night. No record was kept as to what the men did with his body. During the Southern Journey, Evans had earlier inflicted an accidental knife wound to his own hand, whilst mending sledge runners with Tom Crean. It had failed to heal properly, and Evans chose to conceal the injury from Scott, fearing that he would not be selected for the final push for the pole. None of the men knew who Scott would select to accompany him, on the last stage of the epic journey, and all clung to the hope that they would be among the number. None more so than Edgar Evans, who it seems, had plotted his future around the fame generated by his reaching the South Pole. Evans planned to return to his home, on the Gower Peninsula, in Wales, and open a public house. He envisaged a bustling trade, as people would surely flock from miles around, to slug ale, in the presence of a man, who had stood with Scott, at the end of the earth. It was a shrewd business plan, and one that Evans did not want to jeopardise. Had he informed Scott of his injury, he would no doubt have been sent back to base, with the last supporting party, on January 4th 1912. Ironically, it would in all probability have been Tom Crean, who would have taken his place in the polar party. Crean, who had served with Scott, since the 1901, Discovery Expedition, was bitterly disappointed, not to have been selected. Despite the fact he almost certainly knew of Evans’ injury, Crean accepted the decision of his Captain, at face value, and said nothing of the matter. In all likelihood, Edgar Evans could have survived the return journey, of the last supporting team. Bearing in mind that he died the day before Crean reached Hut Point, after his epic solo march, to save the life of Lt. Edward Evans. He could have returned to Wales, and opened his inn, to a public, who were ultimately more engrossed in the desperate tragedy, than they would ever have been in a glorious triumph. 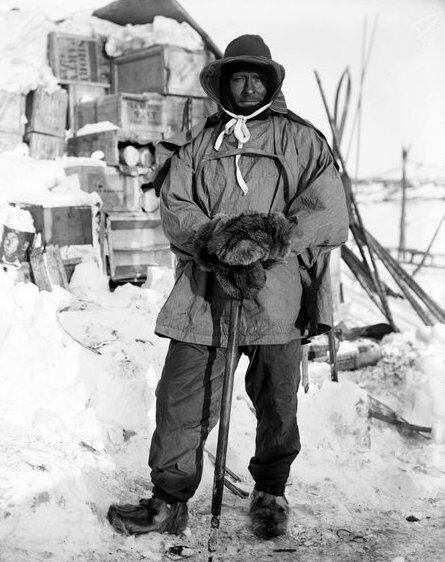 As one of the last three men to see Scott and the Polar Party alive, Edgar Evans, would no doubt have ran a booming trade. As it was, it was he who went south, and Crean turned north, when they parted company on the Polar Plateau, that January 4th. Crean would later fulfil the dream of his good friend, Evans, shortly after his retirement in 1920. He returned home to the village of Annascaul, in Co. Kerry, and opened the South Pole Inn, which he ran with his wife Ellen. A seed of an idea, planted by Edgar Evans, deep in the ice of Antarctica, which flourishes to this very day, keeping the legacies of those two great men alive. Tom Crean and Edgar Evans mending sleeping bags in 1911. The Worst Journey In The World – Apsley Cherry-Gerrard.